John Bessarion had a remarkable ecclesiastical career. Born in Trebizond in 1403, he was educated at Constantinople and Mistra in the circle of Gemistos Plethon. His firm commitment to defending Platonism, a doctrine reconciling the heritage of Antiquity with Christian thought, showed the influence of the great Byzantine philosopher. Bessarion, a brilliant preacher, became metropolitan of Nicea in 1437. One of the firmest partisans of the unification of the churches, he accompanied the Byzantine Emperor John VIII Palaeologus and the Patriarch Joseph II to the Council of Ferrara-Florence in 1437–1439. He wrote numerous theological treatises on the Fililoque, a controversial issue at the Council, and led the discussions on behalf of the Greek delegation. In his opinion, uniting divided Christianity was the condition requisite to lead a crusade to free Byzantine from the threat of the Ottoman Turks. He used all the confidence he enjoyed at the Council in favour of the union, thus becoming a hero of the unity between the Orthodox and Catholic churches. Because of his intercession, Pope Eugene IV raised his rank to that of cardinal of the Latin Church. In Constantinople and Mistra, this appointment was viewed as apostasy in relation to Orthodoxy. With the exception of a visit to Greece in 1443, Cardinal Bessarion spent the remainder of his life in Italy, and died in Florence in 1472. Bessarion embodied, in a quite unique fashion, the ambition of uniting Christianity. His authority as cardinal spread over all the southern monasteries of Italy, while in Basilicata and Sicily the Greek monasteries ceased to follow Orthodox rule and turned to the rule of Rome, even though they remained Greek. Bessarion postulated twice for the pontificate, and narrowly missed election because of his prestige (AMBIGUOUS). In 1463, he was named Latin Patriarch of Constantinople. In parallel to his career as an ecclesiast and theologian, he was also one of the masters of Hellenist humanism, as well a philosopher. This learned man headed an academy in Rome, where the works of many ancient Greek authors were translated. A patron of the arts who also collected manuscripts, Bessarion assembled a sizeable collection of humanist documents. In 1468, he bequeathed to the city of Venice 482 Greek manuscripts and 264 Latin manuscripts, thus laying the foundation for the famous Biblioteca Marciana, the Library of Saint Mark's, where his collection comprises the most precious part of the institution's Greek works. The Cardinal's emblem is found in several manuscripts. In the 1767 manuscript of the Biblioteca Marciana in Venice (Bib. Marc. 110. D 30), this emblem shows a medallion bearing a cardinal's cross and hat. Within the medallion is a diagram of heaven, from which rays radiate, and a cross held by two arms. One of these arms represents the Latin Church, while the other represents the Greek Church, and together with the cross make up the sign of union. 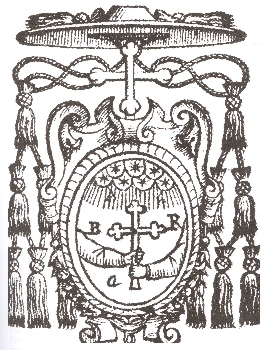 Bessarion's emblem translates the symbolism of unionism and the convictions of this erudite Byzantine, a patriarch and a cardinal, who embodied the humanist ideal of the Italian Renaissance. They had been separated since the schism of 1054. Bessarion, J. Orazione dogmatica sull’unione dei Greci e dei Latini. G. Luisini, trans, Naples, 2001, Vivarium. Bianca, C. “Da Bisanzio a Roma” in Da Bisanzio a Roma. Studi sul Cardinale Bessarione, Rome, 1999, Roma nel Rinascimento. Fiaccadori, G., Bessarione e l’Umanesimo, Exh. cat., Milan, 1994, Vivarium. Talbot, A.-M. “Bessarion” in The Oxford Dictionary of Byzantium, Vol. 1., New York, 1991, Oxford University Press. Chastel, A. L’Italie et Byzance, Paris, Éditions de Fallois, n.d.
Evans, H. C., Byzantium: Faith and Power (1261–1557), Exh. cat., New York, New Haven, London, 2004, Yale University Press.